If you have an heirloom garden going with non-hybrid seeds, usually the point of going through the extra trouble of getting the non-hybrid varieties is so that you can save seed from your plants to plant again the following spring. Right? Saving seeds is not always as easy as it sounds, with some plants being easier to save seeds from than others. Today I’ll show you how to save radish seeds–they’re one of the easier seeds to grow and save. First, plant some radishes. If you like to eat radishes, plant a few extra just for seed. If you’re like me and only your husband eats radishes, you can probably just plant radishes like normal and surely there will be extra that get too big that you can claim for your seed plants. ;) The radishes that are going to produce seed are not going to be edible, so keep that in mind. To let your radishes produce seed, simply don’t pull them out of the ground. Let them get big and ugly and then they’ll sprout a seed head that actually goes up pretty high and spreads a bit. It’s not a little radish plat anymore. Of course I didn’t take a picture of them on the plant, but I did have a few radish seed pods sneak into a picture I took of lettuce going to seed. 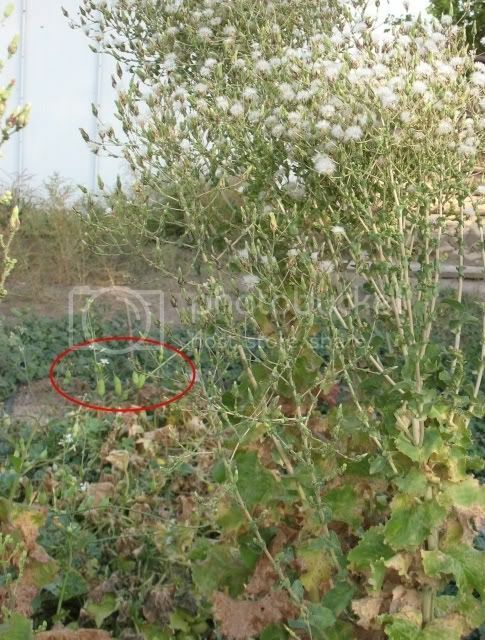 The radish pods are circled in red. You can store them for however long you want in the pods–they’re nice and dry in there, they just take up more space than necessary and you can’t actually plant them until you get the seeds out of the pods, so eventually (like in the middle of January when there’s not much else going on) you’ll want to get the seeds out of the pods. To save the seeds, just break open the radish seed pods. The tiny radish seeds are inside the pods. Some of them are harder than others, you might end up getting out your nut cracker or using a blunt object to kind of crack the pods open to save your fingers! Save your seeds in a cool, dry place and label the packaging so you remember which year you harvested them. If you’re interested in saving seeds, I fully recommend Suzanne Ashworth’s book Seed to Seed that covers techniques for saving seeds from most all the edible plants you’d want to save seeds from–many I’ve never even heard of! 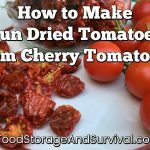 And, if you’re planning on saving seeds in a survival situation, it’s a really good idea to start now so you’ll be comfortable and competent at it if the time comes when saving seeds is the only way to get next year’s garden. Where did you learn that there are parts of the radish that become inedible post-seed, Angela? When the radish goes to seed, the root part becomes quite tough and woody, so it’s not that it is actually inedible, just that it isn’t one you’re going to slice up and put on your salad anymore. I suppose you could still eat the root part if you wanted to chew on it and I’ve actually seen where someone collected the green seed pods and pickled them, so if you get creative you could still eat a radish that has gone to seed. That clears it up for me. Thanks for the prompt answer! Can you plant the dried pods with the seeds inside? Picking out all these seeds seems pretty labor intensive. Wouldn’t they grow from the pods in the wild?